Dr. John Campbell grew up in western Pennsylvania and attended the University of Pittsburgh for undergraduate training and medical school. His residency training took place at UPMC Shadyside in Pittsburgh, Pennsylvania. The Air Force brought him to Colorado in 1999 where he spent four years at Peterson AFB in Colorado Springs. He was deployed to Turkey serving as an urgent care physician. In 2003, he separated from the Air Force and entered private practice in Littleton, Colorado. He has been with Founders Family Medical Center since August of 2006. 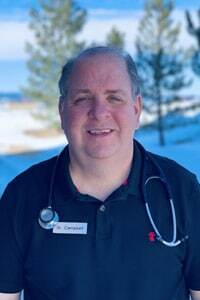 Dr. Campbell enjoys the wide range of patients that family medicine provides and has a special interest in preventive medicine and men’s health issues. His current associations are the Colorado Medical Society, Arapahoe-Douglas-Elbert Medical Society, American Academy of Family Physicians and the Colorado Academy of Family Physicians. In his personal time, he enjoys his family and skiing whenever possible. Your office has always been kind, attentive never had any problems here. I like your office and staff really like Beth and Noah,I believe everyone here does care.